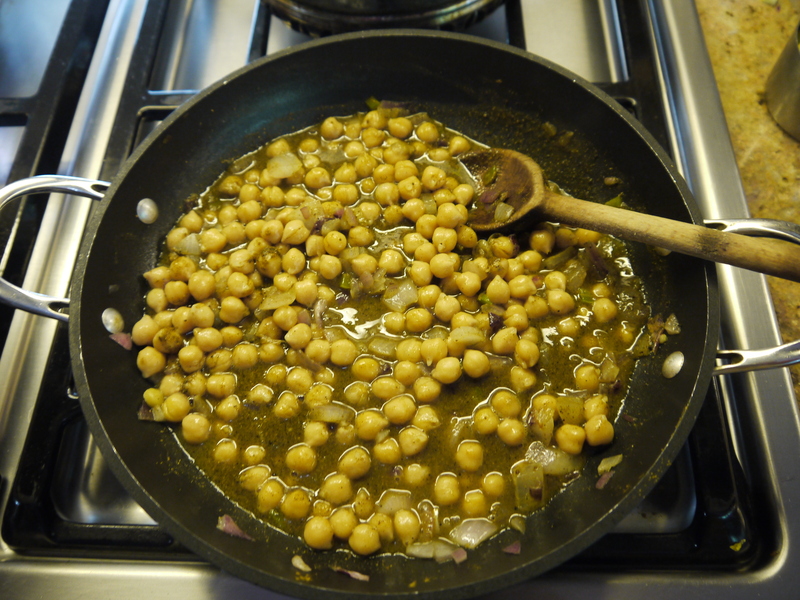 This week I was preparing a favorite around my house, channa masala. It is vegan, quick to make and delicious with some fragrant basmati rice and store bought naan bread. 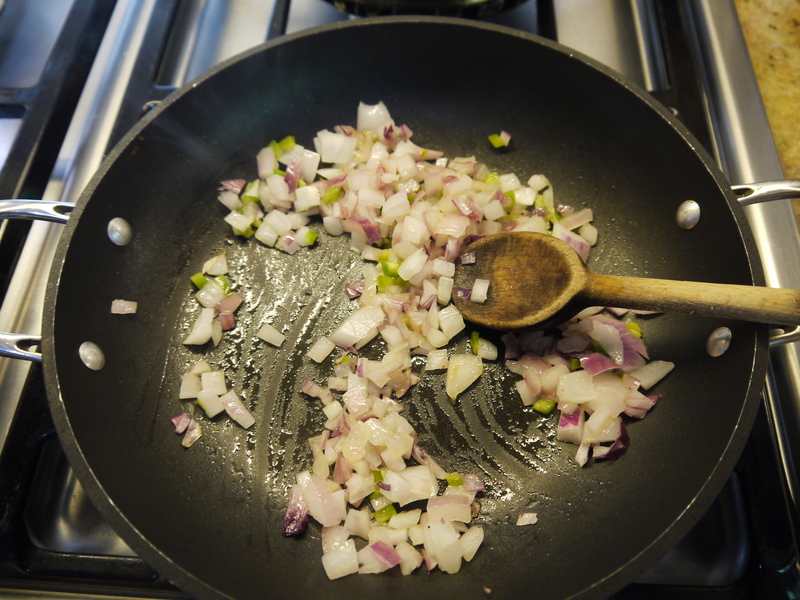 First you sauté some onion in oil. I added a tablespoon of minced jalapeño, kicking up the heat a little. Start a pot of rice now so it will be ready when the dish is finished. 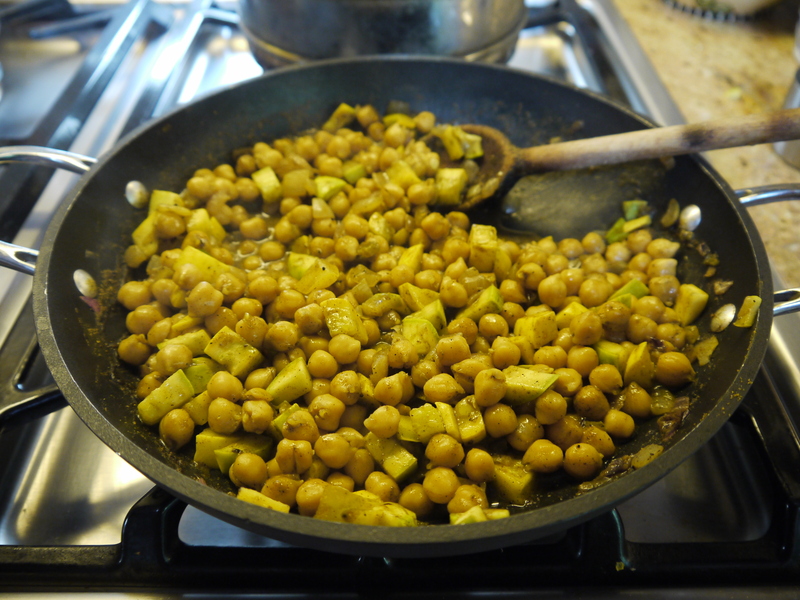 Then add a can of chickpeas and their liquid, some channa masala spice mix* and vegetables of your choice. In the winter months I add cauliflower broken into small florets, in warm weather, summer squashes work well. 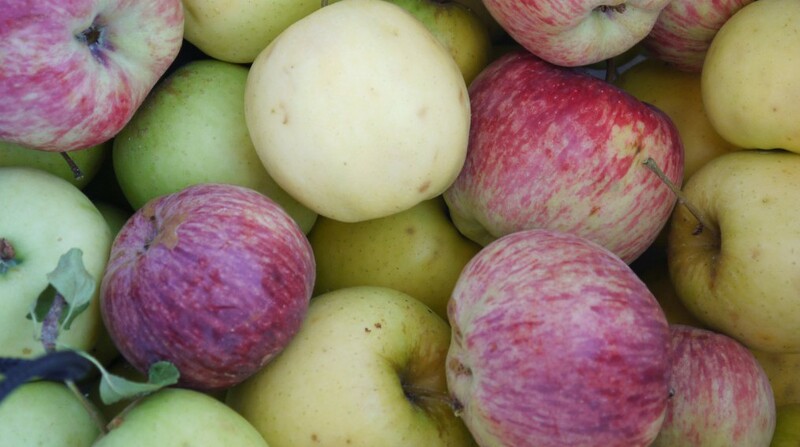 After the liquid reduces a little stir in a chutney* – such as mixed fruit, mango or tamarind – then it’s all ready to go. Mix toasted almonds and raisins (about 1/4 c. each per 1 cup dry rice) to the basmati rice right before serving for crunch, sweetness and an exotic note. Top the channa masala with chopped tomato and spicy cilantro* or mango chutney and voila! A tasty dinner is on the table in 30 minutes without too much effort. * I like Sukhi’s brand of channa masala spice mix and chutneys and Trader Joe’s organic basmati rice and garlic naan from their freezer section. 1. Heat oil in a 10 inch frying pan until shimmering. 3. Add peas and liquid and summer squash and simmer over medium low heat until liquid has reduced by 1/4 and vegetables are tender. 5. Serve the channa masala on a bed of hot basmati rice, top each serving with the tomato strips and cilantro chutney. 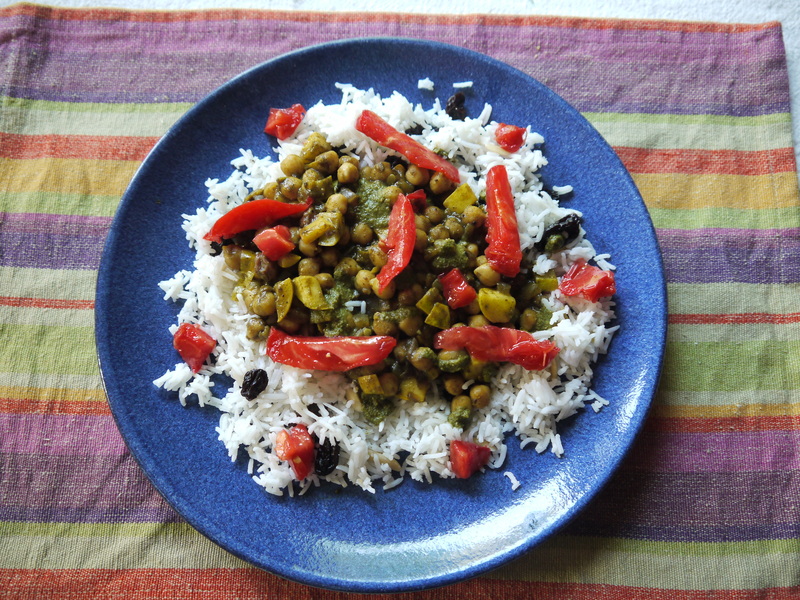 This entry was posted in Main Courses, Recipes, Uncategorized and tagged channa masala, chickpeas, chutney, fragrant basmati rice, mango chutney, recipe. Bookmark the permalink.